Florida Weimaraner Rescue Inc. is affiliated with Big Dog Ranch Rescue. Together, these organizations are dedicated to saving as many dogs as possible. We share common staff, facility, volunteer, foster and donor networks. 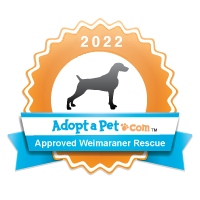 Our mission is to promote and preserve the lives of as many Weimaraners as we can through education, community outreach, and rescue. Check out our wonderful Weims available for adoption. We know you will find the love of your life. Click here to adopt. Weims are active, strong, fast and have lots of energy. We love them! Click here to learn more about this amazing breed. Thank you so much for your donation. We really appreciate all the support and love! Click here to donate. Fostering a Weim will be one of the greatest joys of your life. You will laugh all day at their silliness. Click here to foster.